Photo By Taryn Lamb: From left, associate music professor Chase Moore, Yamaha representative Lori Frazier, Fine Arts Division Chair Steven Higginbotham, and Dean of Instruction Dr. Phil McBride express their pleasure with the new keyboard donation. 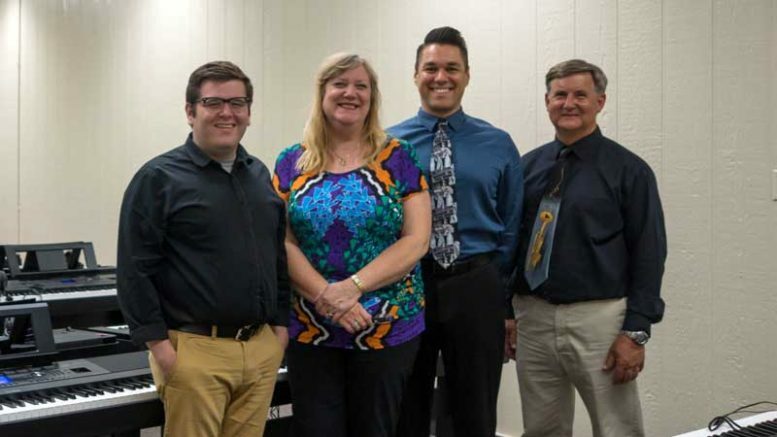 THATCHER — Eastern Arizona Courier Associate Music Professor Chase Moore had the best week ever last week when Lori Frazier of Yamaha Corporation arrived on campus with 17 brand new Yamaha keyboards from Hachenberg & Sons Piano in Tucson. Professor Moore spent the afternoon learning how to use and care for the keyboards, and with Frazier’s training, is now ready for students to take advantage of the equipment. The updated piano lab has helped list EAC’s piano and music department as equal to a university level showcase. “The modernization of this lab will better equip our students for their future studies and will expose them to the marriage of technology and music in the classroom,” Moore said.